Local Village Areas - Available shortly - Please call for details. 1) WE SEEK DISTRIBUTORS FOR RURAL & TOWN AREAS of Bicester. 2) WE ARE INTERESTED in securing the services of a coordinator and / or rural distributor to manage new areas in Bicester North. Contact Steve, 07756 544 511 / 01327 353753 for further information. 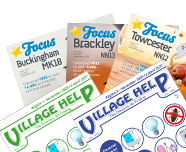 * ALL DELIVERY ROUNDS ARE COVERED BY FOCUS MAGAZINE GROUP WHEN SHOWN AS AVAILABLE. PART / FULL TIME - Salary >£18k, plus commission on sales.